No, it’s not climate change—although residents in Vienna will tell you that being able to sit at a sidewalk café in early March is certainly a change from the past. But they’re also likely to be enjoying another kind of heat at those tables outdoors: spicy goulash soup or piquant bright-red sausages garnished with freshly grated horseradish, all washed down with a cold beer. For centuries Vienna has been a culinary crossroads. As the capital of an empire that once covered a large swath of Europe, Vienna has long been has long been a city of monumental architecture and heroic statues, grand palaces and stately parks. And as a cultural and political center, it attracted residents from every corner of the empire, who brought their food preferences with them, and whose tastes and talents gave the city its own special character. That empire collapsed in 1918, at the end of World War I, and a generation later Vienna was badly damaged in World War II. From 1945 to 1955, Austria was occupied by the victors—the United States, United Kingdom, France, and the Soviet Union—bringing more culinary influences into the capital. But for a long time after the war Vienna retained the slightly shabby look of a Central European city that had seen better times. Slowly, for nearly half a century, the city worked its way back to prosperity, becoming the seat of several branches of the United Nations, and the headquarters of nongovernmental organizations and international businesses. I think of Vienna today as an aging dowager empress who’s discovered the fountain of youth. During the past 20 years, Vienna has regained its former glory, albeit in more modern clothes. Run-down areas of the city were spruced up, new museums were built and older ones restored, trendy restaurants and boutiques popped up like mushrooms, and a new generation of young people put their own stamp on the city. Since 2007, Vienna has often topped the list of the world’s cities with the best quality of life. Today this metropolis of nearly 2 million people is one of the ten most affluent cities in the European Union. Vienna is also a city that eats out. As the capital of the old Austrian Empire, its classic cuisine combines Germanic, Slavic, Hungarian, and Balkan influences. In addition to the many restaurants that feature traditional Central European dishes, today’s Vienna also boasts plenty of sleek Italian restaurants decorated in the latest minimalist-modern style, trendy new wine bars, sidewalk cafes serving shawarma and sushi, and little eateries featuring Korean barbecue, Thai noodles, or Texas chile con carne. But Vienna’s earlier cooking included many tongue-tingling dishes, too, especially from Hungary and the Balkans, which seduced the Viennese into loving heat, from spicy sausages to zesty stews to hot-pickley spreads for bread. Sausage stands, like the one at left with a variety of chile-seasoned sausages at a festival stand, are a Viennese culinary tradition. From early morning until late at night, these outdoor kiosks serve a variety of boiled, fried, and grilled sausages categorized as either süss (sweet, meaning mild) or scharf (hot-spicy), often with fresh horseradish grated straight onto the plate, your choice of hot or sweet mustard, and side orders such as sauerkraut, potato salad, and french fries. Drinks range from colas to beer to champagne. You’ll see everyone from politicians to priests to punks munching on sausages there. Look especially for red sausages labeled Kabanos, Polnische, Bosna, Debrezener, scharf, and pikant. Many of Vienna’s historic coffeehouses also serve a variety of succulent sausages in an atmosphere that harks back to the 19th century city of artists, writers, musicians, and revolutionaries who spent hours every day at these coffeehouses—reading, writing, composing, debating. Makes you wonder if some of the city’s most revolutionary ideas were fueled not only by the caffeine in the coffee, but also by the heat in the food. 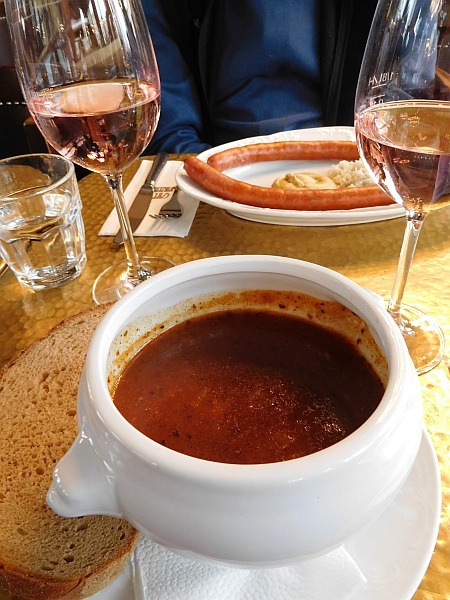 Hungarian goulash stew and bright-red goulash soup are standard items on coffeehouse menus, as in many other restaurants throughout the city. The Hungarian influence on Viennese cuisine can’t be underestimated (it was the Austro-Hungarian empire for a while!). There’s even a Goulashmuseum Restaurant in Vienna that offers 13 varieties of goulash—made with beef, pork, chicken, fish, and yes, even horse—in addition to the ubiquitous goulash soup. 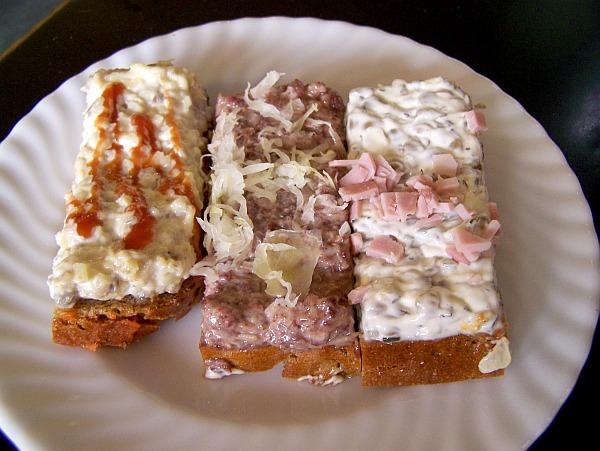 Open-face sandwiches known as Brötchen are another culinary tradition in Vienna, dating back more than a century. (Brötchen means little bread rolls or buns in other German-speaking countries, but Austrians have their own quirky terms for many foods.) Also known as offene Butterbrötchen (buttered open-face sandwiches) because the thinly sliced bread is usually lightly buttered before the toppings are applied, these savory sandwiches are capped with meat, fish, seafood, cheese, eggs, mushrooms, vegetable salads, or a variety of spreads (smooth or chunky), sometimes with garnishes that run the gamut from chopped chives to caviar. Many of them are so beautifully constructed they look like miniature works of art. A popular place to sample Brötchen is Trześniewski’s (at left), which has been making its own distinctive style of open-face sandwiches since 1902. Its Brötchen are so popular that there’s often a line out the door at the flagship sandwich shop in Vienna’s city center. Inside, a long glass counter displays 22 kinds of open-face sandwiches, each spread with a different flavor combination of minced meat, fish, mushrooms, eggs, cheese, or vegetables, sometimes seasoned with horseradish or peppers, sweet or hot. Customers devour these little rectangular Brötchen, along with a small glass of wine or beer, in the miniscule eating area indoors or while standing around a couple of tiny tables outside, rubbing elbows with other loyal locals who’ve been coming to Trześniewski’s for decades. 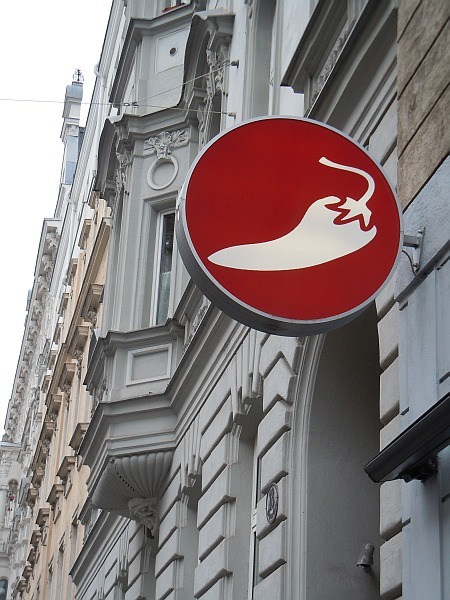 Many grocery shops, supermarkets, and fine-food stores in Vienna sell a variety of hot and sweet peppers, as well as spice rubs, hot pepper pastes, and hot sauces from all over the world. Holiday festival stalls offer Chilikäse (aged cheese spiked with hot red peppers), grilled Chili-Bratwurst, slabs of hot-spicy meatloaf called Chilileberkäse, and jars of habanero jelly, chile-flavored mustards, and red jalapeño paste. 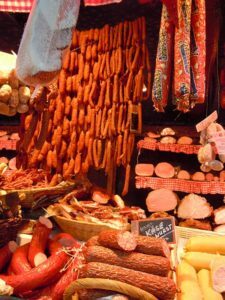 But the best single place to get a visual (and actual) taste of spicy Vienna is at the colorful Naschmarkt, the largest and best known open-air market in Vienna, which extends for nearly a mile along a boulevard lined with several beautiful Art Nouveau buildings. Open from Monday through Saturday, its 120 food stands, cafes, and little restaurants offer a huge array of fresh fruits and vegetables, meats and cheeses, fish and seafood, pickles and sauerkraut, herbs and spices, breads and pastries, as well as cooked foods to eat on site or take away, ranging from traditional Austrian specialties to Russian, Japanese, Indian, and Middle Eastern dishes. You can easily spend hours noshing around this crowded market, marveling at the variety of victuals for sale, and eating your way from one food stand or cafe to the next. 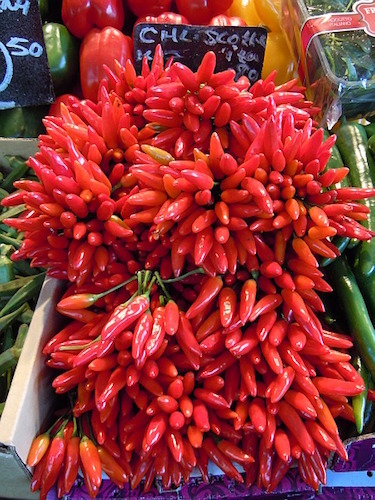 Look for fresh or pickled hot peppers filled with sheep’s cheese, pickled peppers stuffed with sauerkraut, hard cheeses seasoned with hot peppers, cheese balls rolled in a heavy coating of hot red pepper flakes, and plenty of sausages flavored and colored with powdered chiles, from Italy, Spain, Hungary, and the Balkans. Follow the local chile-heads to the Chili-Werkstatt, near the Pilgramgasse subway stop. This specialty shop sells pepper plants, seeds, sauces, spices, oils, pastes, and rubs, as well as offering workshops on chile peppers and cooking classes featuring recipes from the owners’ own award-winning cookbooks. Finally if your sweet tooth tends toward the hot, here’s an idea for a spicy Viennese dessert. Using a good recipe for the famous Sachertorte chocolate cake that was invented in Vienna, sneak some ground chipotle into the apricot jam that coats the cake before the final flourish of chocolate glaze is spread on. Chocolate and chipotle are a marriage made in heaven! But don’t let Vienna’s professional bakers hear about this trick, or they might get some spicy ideas, too. NOTE: Use small thin squares of bread with crusts on all four sides, such as Rubschlager Cocktail Breads (rye, pumpernickel, sourdough, whole grain); or diagonally cut 3/4-inch-thick slices of French-style baguettes; or rectangular slices of densely textured brown or black breads, cut about 2 inches wide, 3- to 4-inches long, and 1/4-inch thick. Butter the bread very lightly before covering the entire top with one of these spreads. Tear the bottled roasted peppers into large pieces and drain in a sieve, using the back of a large spoon to press out as much liquid as you can. Pulse the bell pepper pieces in a food processor to chop them up a bit, then add the drained roasted peppers and the hot pepper, pulsing until all the peppers are well chopped but still somewhat chunky. Transfer the mixture to a sieve and again press out as much liquid as you can. Stir the pepper mixture, garlic, and salt together in a bowl. Cover and refrigerate until needed (up to 5 days). Yield: Makes approximately 3 cups. Drain the pepperoncini slices in a large sieve, rinse well under cold water, and use the back of a spoon to press out as much liquid as you can. Pulse the bell pepper pieces in a food processor to chop them up a bit, then add the drained pepperoncini slices and hot pepper, pulsing until all the peppers are well chopped but still somewhat chunky. Stir the pepper mixture, mayonnaise, and sour cream together well in a bowl. Cover and refrigerate until needed (up to 5 days). A classic at many of Vienna’s restaurants, taverns, and coffeehouses. Photo at Café Schwarzenberg in Vienna. Heat the oil over medium-high heat in a 5-quart stock pot, and sauté the onions until they begin to turn brown. Add the beef and bacon to the pot, and cook, stirring constantly, until the beef is browned on all sides. Add tomatoes, potatoes, bell peppers, and garlic. Stir well to combine all the ingredients in the pot, then add all the remaining ingredients, stirring until well blended. Bring the mixture to a boil, over high heat, then reduce the heat and simmer the soup, partially covered, for 45 minutes to 1 hour, stirring occasionally. Taste and add more salt, if desired (depending on the saltiness of the beef stock). Serve hot, in bowls, accompanied by slices of rye bread and glasses of beer. 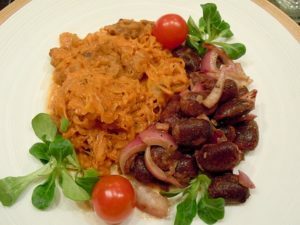 A popular Hungarian pork-and-sauerkraut dish found on the menus of several traditional Viennese restaurants. Photo at a home-cooked meal in Vienna. Heat the lard, butter, and vegetable oil in a large skillet over medium-high heat until all the fat is melted. Sauté the chopped onion until translucent. Remove the skillet from the stove, sprinkle the paprika over the onions, and stir well. Add the pork and mix well. Return the pan to the stove and cook the pork over medium-low heat, stirring constantly, until it is browned. Add the chopped green and red bell pepper, garlic, caraway seeds, dried hot pepper pod, and chicken stock. Stir well. Serve on a plate, as a main course, accompanied by boiled potatoes or egg noodles. Yield: Makes 4 large or 6 medium servings. 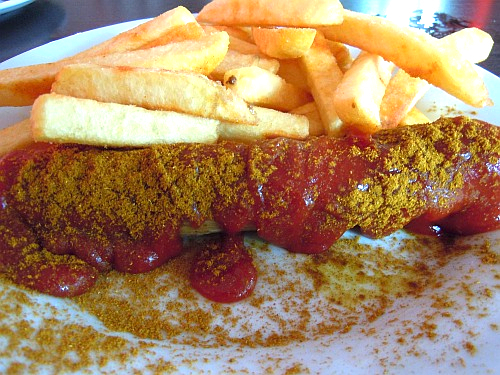 Spicy beef goulashes like this are often served on the lunch menu at Vienna’s beer taverns and coffeehouses. Melt the lard or heat the sunflower oil in a 4-quart stovetop casserole or stockpot. Sauté the onions and bacon over medium-high heat until the onions are translucent and very soft. Remove the pot from the heat, sprinkle the paprika over the onions and bacon, and stir to combine well. Add the cubed meat and mix well. Return the pot to the stove and cook, stirring constantly, over medium heat until the meat is browned on all sides. Stir in the mushrooms and garlic. Dissolve the tomato paste in the beef stock and add it to the pot, along with the salt and pepper, stirring to mix well. Bring the mixture to a boil over high heat, then reduce the heat to very low, cover, and simmer for 45 minutes, stirring occasionally. Serve hot, garnished with fresh onion rings and a sprinkling of freshly grated horseradish, and accompanied by boiled potatoes, egg noodles, or bread dumplings, and plenty of cold beer.